In the Art Room, Members are able to explore all kinds of creative mediums and build on their existing skills. The first three days of the week are dedicated to the specific disciplines of Drawing, Painting, and Crafts, with group stations and new projects every week. On Thursdays, the Art Room hosts the BGCA Program Lyricism 101, dedicated to developing young voices in the medium of spoken word poetry and rap. Friday hosts an open studio where members are able to choose what they want to work on. 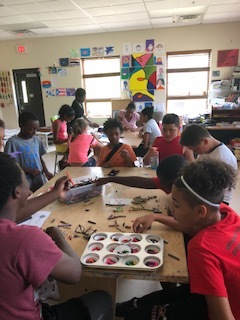 As opposed to an Academic Art Experience, the cornerstone of daily activity at Carter Road is art as a form of connection and communication. By incorporating collaborative design and sharing materials, Members learn how to work together in a studio setting and assist in each other’s creative endeavors without hard deadlines, internal competition, or grades. Focus is also on useful, transferable skills such as sewing, braiding, color mixing, hand lettering, and creative problem solving. As the 2018-2019 year kicks off, projects have already included pillow making, line drawing, finger knitting, and watercolor still life painting. Our Art Room is home to all the necessary materials and equipment to facilitate future projects in ceramics, printmaking, screen-printing, fashion design, and multiple other mixed-media mediums. By providing members with the opportunity to learn directly about what they’re interested in, and showing them how art can exist in and change the world around them, the Carter Road Art program gives them the freedom to create without fear.